The public inquiry into the 1997 rail disaster at Southall in West London is to re-open today 20 September 1999. Under the chairmanship of Professor John Uff, the inquiry, set up by the Health & Safety Executive will seek to establish the causes of the accident and to make recommendations designed to prevent similar accidents occurring in the future. 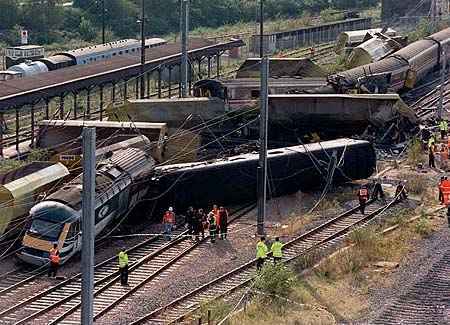 The accident occurred on 19 September 1997 when an Inter City 125 train, operated by Great Western Trains passed 3 danger signals and collided with an empty freight train. Seven people died in the accident. TV Cameras In a first in proceedings such as the Southall Inquiry, TV and Film cameras are to be allowed to film the events. The chairman, Prof. John Uff has set some stringent conditions however, including a requirement that there must be a delay of at least an hour before pictures may relayed. The inquiry opened in February 1998, but was adjourned because of criminal proceedings against the train driver and Great Western Trains. At the court hearings, held in July 1999 charges of manslaughter against both defendants were dismissed. Great Western Trains however pleaded guilty to a charge under Health & Safety legislation and were fined a record £1.5 million. He is the man in charge of safety, yet he is not here. He has not taken the trouble to come to court. I would have thought he might have been here if your clients were really concerned about this matter. A considerable amount of new evidence is to be presented to the Inquiry. This will include information from British Transport Police, who carried out the criminal investigation after the accident which will show that there had been failures of the Automatic Warning System (AWS) on GWT trains on 63 previous occasions. The inquiry will also hear that there was insufficient time for the IC125 train to be turned around to allow the driving cab with a working AWS to be at the front. It was only allowed a few minutes "turn round" time at Swansea before setting-off again to London. This was to avoid GWT being charged a penalty by railtrack £50 for each minute it was late arriving at its destination. There are some 30,000 documents which will be examined and some previously unseen video footage of the accident, shot by a railway worker will be shown. The inquiry is likely to last for 10 weeks with its results published early next year.